Start after darkness (19:00 –20:00). Ascent from Azau station by snow cat. 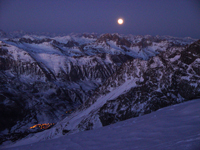 Descent from Pastukhov Rocks to Azau bottom lift station under full moon or with head lamps. You will be accompanied by guides and rescuers.